Over the last few days, I've been puttering in the garage as the weather is quite cold. Speaking of Yagi, I'd noticed the battery she came with didn't seem to hold a charge for long. The records I got from the previous owner showed it was less than 3 years old too. 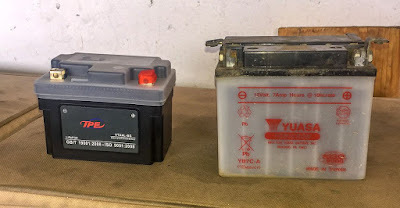 Some reading online at the TW200 forum showed that the stock flooded batteries don't tend to last very long. Disregard battery replacement, ended up returning it. So I ordered a LIFePO4 Lithium Ion battery. No maintenance and when I drop the motorcycle, no worries re spilling acid. The battery got here today and at first I was suspicious. Not only was it so light that it felt like an empty plastic case in my hands; it was much smaller than the stock battery! Still with doubts, I went ahead and prepared Yagi for the replacing of the battery. The new battery being smaller, I had to cut to fit some padding using an old Army Sleeping Pad. The new battery is cushioned from below, and all sides and the top to create tension on the rubber hold down strap. 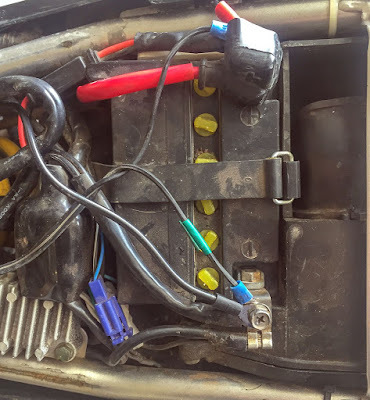 New battery in place, snugged up. Yagi is now sitting on the battery charger for today and will take her for a ride once the battery reaches float mode. The new battery and the removal of the passenger pegs have decreased Yagi's overall weight by 7.7 lbs. Hopefully it'll make a difference when I am picking her up on the trails after a fall. 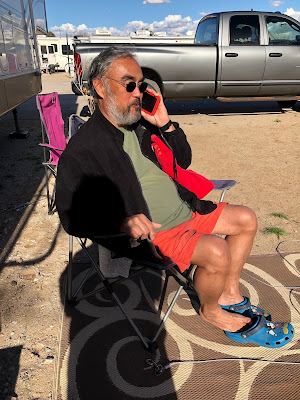 Mar 2, 2019 Update: I didn't know at the time, but have it confirmed through RichardM: The LIFePO4 batteries need to have a "load" placed on them before they "warm up" enough to provide full power or amps. The first engine start of the day, the starter sounded like was not getting much power....it would take 3-4 attempts of 2-3 second presses of the start button to get it to catch. Will try turning on the ignition and let the headlight place a load on the battery for at least 30 seconds and report back. Update: gave up on this battery, not enough cranking power even after waiting a minute of "load". Returned it. Different one inbound. Update: this is the battery I got. The image and link is to the one on Amazon but you can find it cheaper on ebay if you're willing to wait a couple of extra days above what Amazon promises. Same size I believe as the previous battery, but more CCA I believe. Worked like a charm after I charged it up before installing it. The clutch pack replacement and subsequent replacement of the input shaft for the gearbox allowed for her re-assembly yesterday. Took me a total of 5 joy-filled hours to put everything back together but she's mobile again! 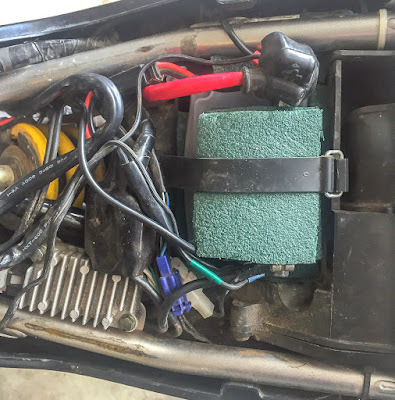 Had to redo the installation of the air box twice as I mis-routed part of the wiring for the left side ECU. Reinstalling the swing arm bolts also took some time. The left side one went on easy enough with the use of a ratchet strap to pull the arm into position; the right side bolt proved "stubborn". Turns out the socket insert the pin screws into had come out of the swing arm and I had to hold it in place with a screwdriver while turning the pin inward. 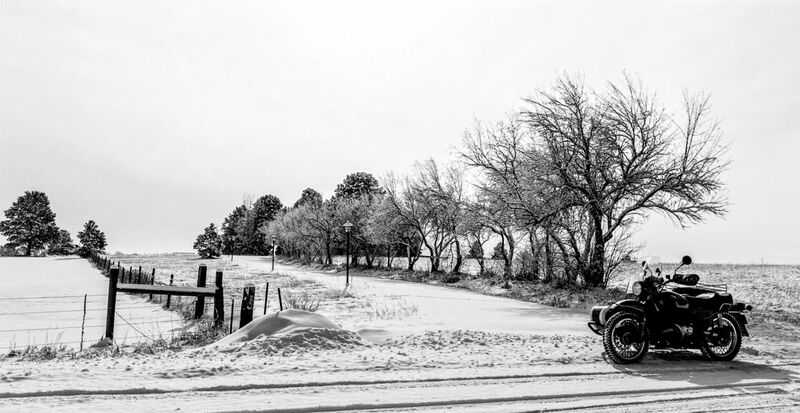 A short test ride (it was snowing of course) and I was able to cycle through all the gears just fine. 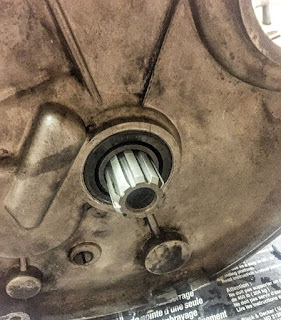 Then I discovered the brake pedal shafts both on the tug and the sidecar were not returning to the off position, leaving my brake lights stuck in the on position. 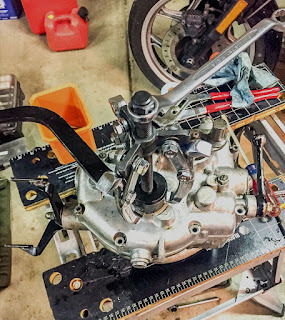 Much hammering was needed, rotating the sidecar brake shaft lever several times before I was able to use a crowbar to force that sucker out! Lubricated with some spray graphite, which hopefully will be better than grease. The above was three days ago. 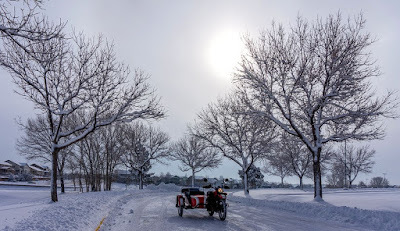 This morning we woke to about six inches of snow and positively balmy (when compared to the temperatures in the last few days) temperatures and sunny conditions. 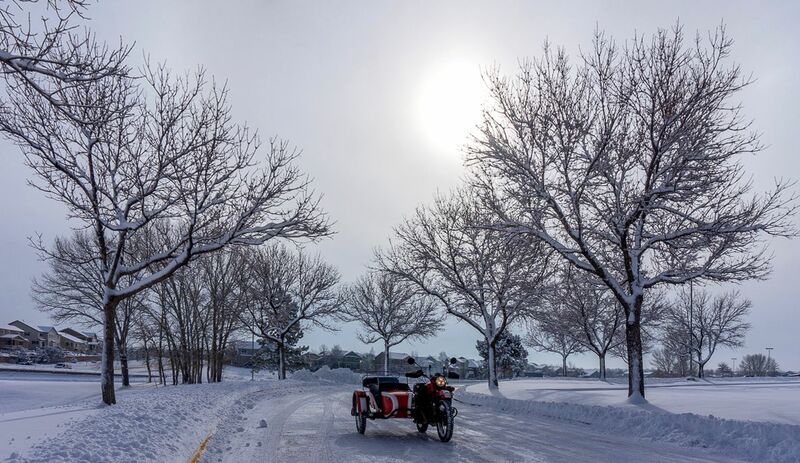 After clearing the driveway and sidewalk, it was time to give Scarlett another test ride, this time in snow. I rode out to the usual spots for pictures, having to engage 2WD a couple of times in the deep stuff as the threads on my Heidenau K37 pusher tire are quite worn down. At the local high school where Martha used to work. Next was the Ponderosa East neighborhood, where they hadn't gotten as much snow as we did, perhaps 3" tops. The sunshine really made a different in the feel of the cold. I didn't even turn on the heated grips for most of the ride! By the time I got home it was above freezing and well on the way to the high 30s as I type this. For now, Scarlett is to remain with us. Perhaps her clutch will last longer if I keep her from the really rough stuff while exploring off-pavement trails. Scarlett's gearbox's input shaft's splines were damaged when the clutch disk splines failed over time. As the splines on the clutch driven plates wore, they damaged the splines on the input shaft. Note the gouges on the splines. Today, I got the part from Holopaw Ural in Florida, the only dealer who had it in stock. IMWA (aka the mother ship) in Redmond, WA had said they wouldn't have more in stock till sometime in March; so I was fortunate to have Terry Crawford offer to call Gene at Holopaw to query him. Thanks gents! Here's the new input shaft, pricey but shiny. 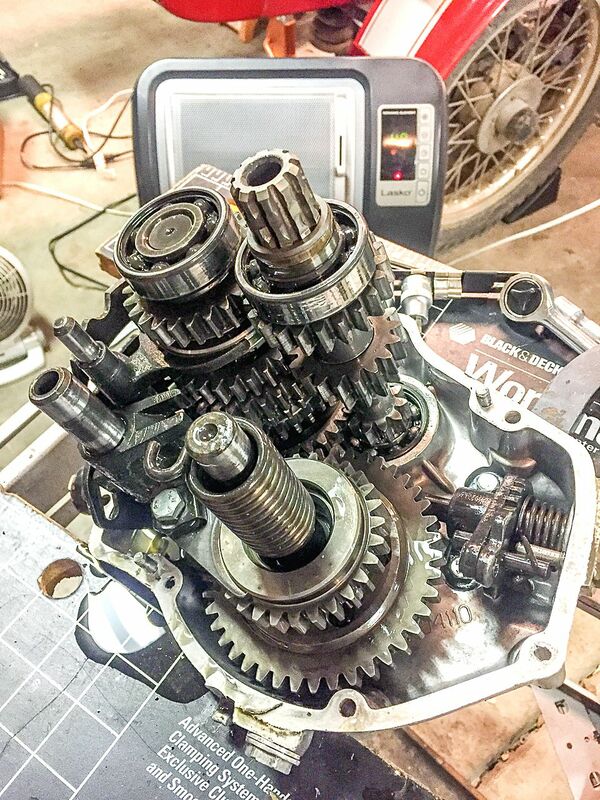 While waiting for the part, I'd cleaned up the gearbox but hadn't cracked it open yet. You see it below, the view from the rear. I thought at this point I didn't have to remove the kick starter lever. I would be proven wrong later. 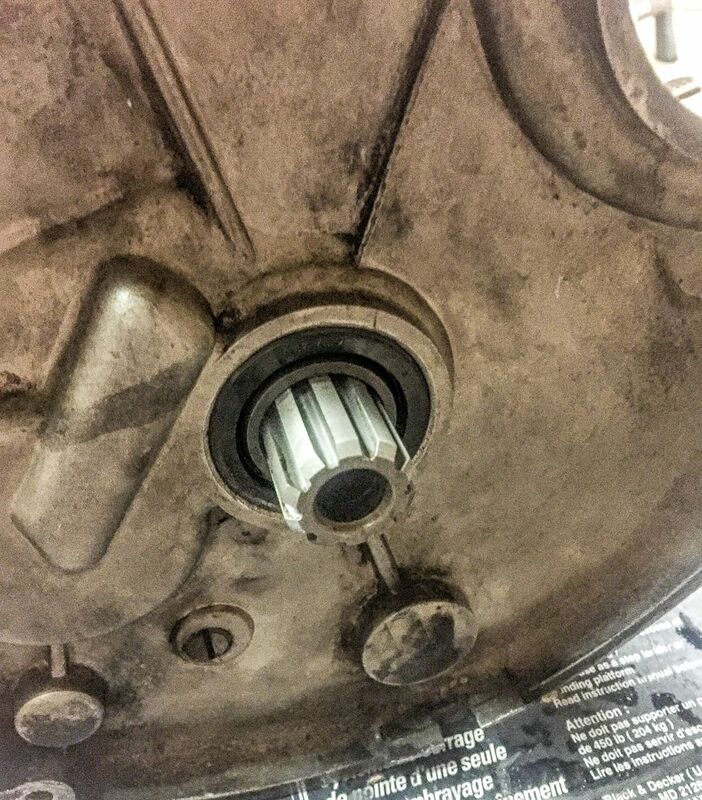 On the plus side, I didn't have to remove any other levers or the output shaft's flexible coupling plate. 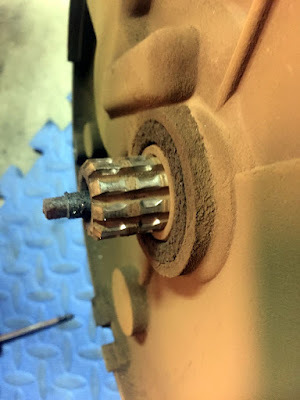 After removing the Allen head bolts securing the two gearbox halves together, a little bit of light tapping with a soft hammer separated the halves and I could see the gearbox's innards. The input shaft is the one with the chewed up splines. It popped right out with no fuss. 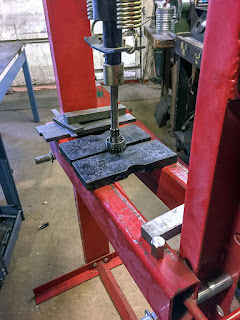 It was then I realized, after a call to RichardM, that a hydraulic press was required to separate the bearing and collar right below the splines on the old input shaft! 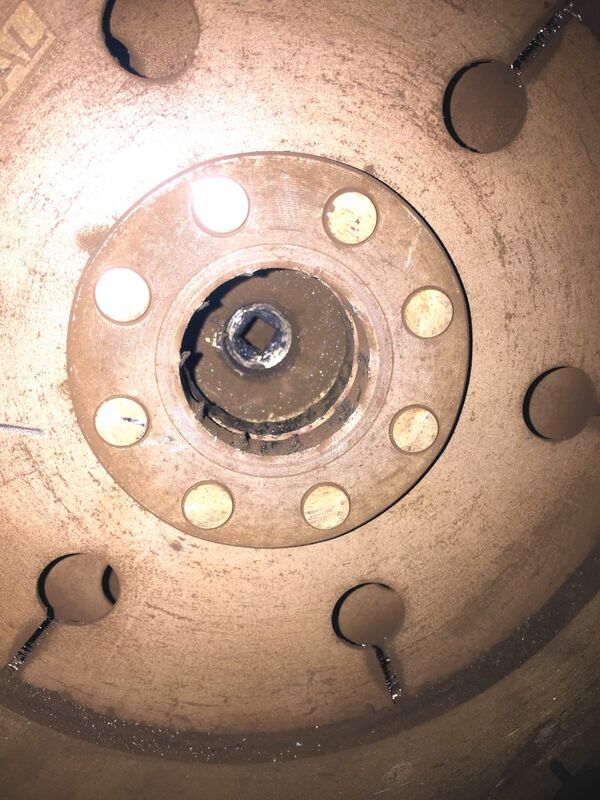 I did first try a bearing puller, but no joy, the collar was holding the bearing very tightly. RichardM suggested simply driving to a machine shop and have them press it out and press the bearing and collar onto the new input shaft. I called around, found a machine shop less than 5 miles away and they took me right in! 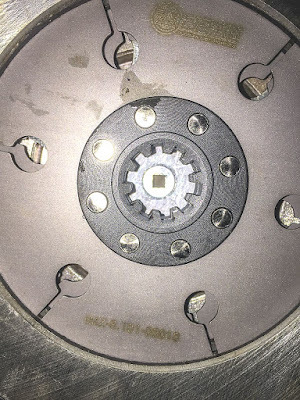 the plates held the gear, bearing and collar in place. Back in the garage, I popped the new input shaft into place with no issues. 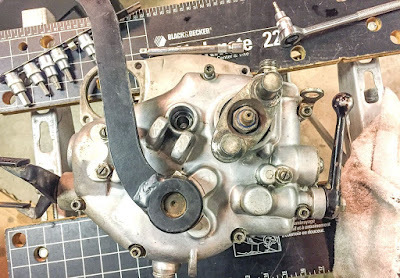 The next 1-2 hours were then spent re-learning how to fit the two halves back together, making sure that the shift lever mechanism meshed on shifting mechanism crank on the side of the case. I would end up doing this about 4 times, each time being a little bit easier. The kick start lever had to come off so I could depress it's mount as part of the kick start spring reset procedure. This took a bit of effort, some hammering and some light cursing to get the pin that holds the lever onto the mount out. Note: next time I'll order a new pin from the dealer, too easy to bugger up this pin while getting it out. Then, I was having trouble, after the pin was out, removing the actual lever! 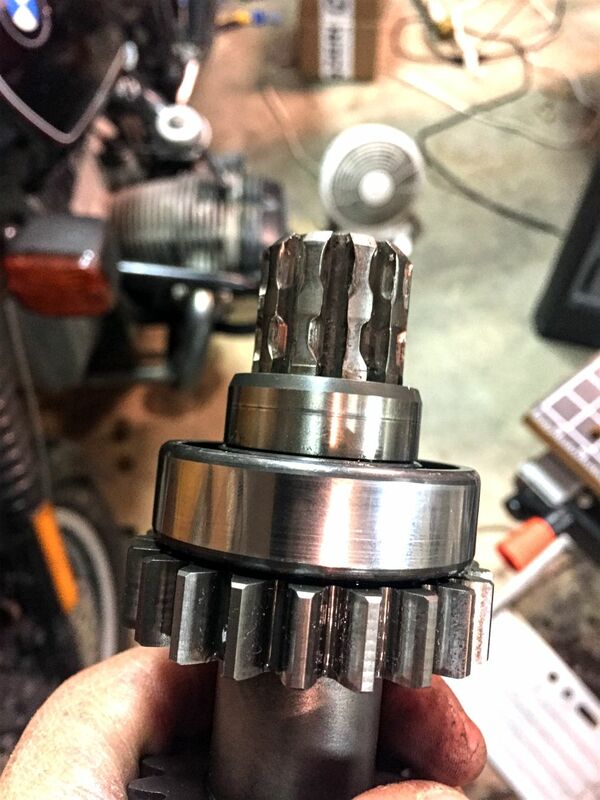 RichardM clued me in again, use the gear puller I had tried on the input shaft bearing with no success. Duh. 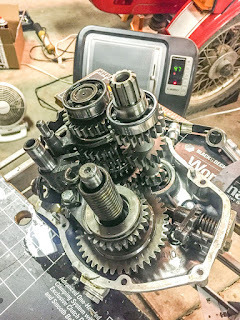 Once the lever was off, and using a 16 mm open end wrench to turn the mount counter-clockwise while pressing down on the mount, I finally got the spring to "reset". The kick start lever was installed with minimal fuss. Since I had only used two bolts so far to secure the halves together, I then separated the halves by perhaps 1/4" (the amount I loosened the two bolts out from their mounts) and applied RTV sealant to the two mating edges. Once done, the halves were bolted back together with all the bolts and the RTV sealant will "cure" overnight. The splines look "mo better" eh. 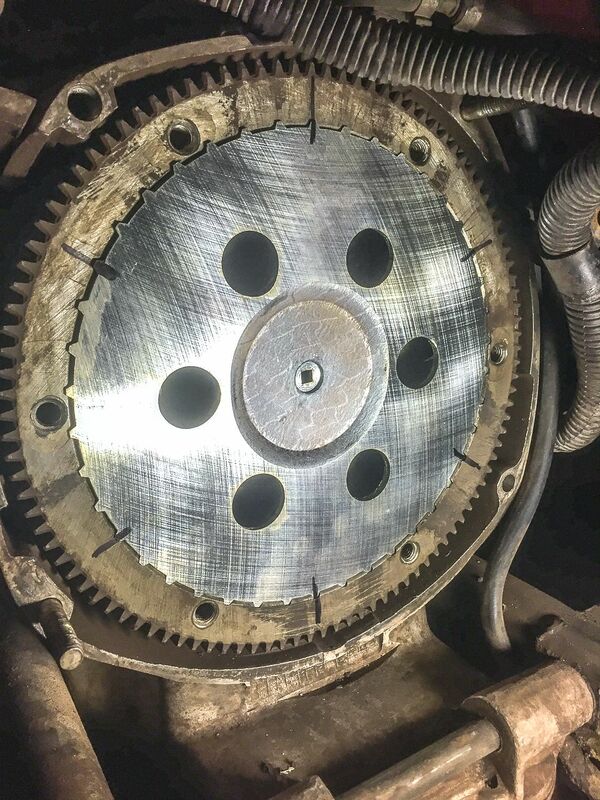 particular repair. It was a bit of a PITA. I'll be assembling the gearbox onto the engine tomorrow, and putting Scarlett back together as well. 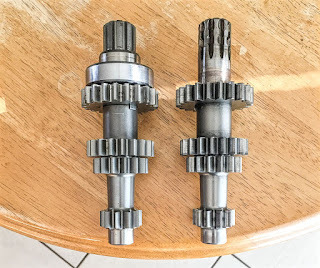 The parts to replace the worn components of Scarlett's clutch pack arrived yesterday; minus the input shaft for the gearbox. The shaft should be here Monday according to UPS tracking. 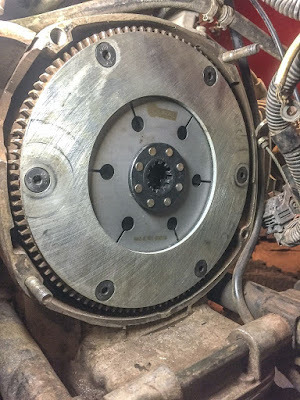 After reviewing the install videos made by fellow Uralista and friend: Darrell S., I was ready to install the clutch pack. Note: He mentions using Blue Loctite, it's supposed to be Red Loctite, he just hasn't updated the video I guess. 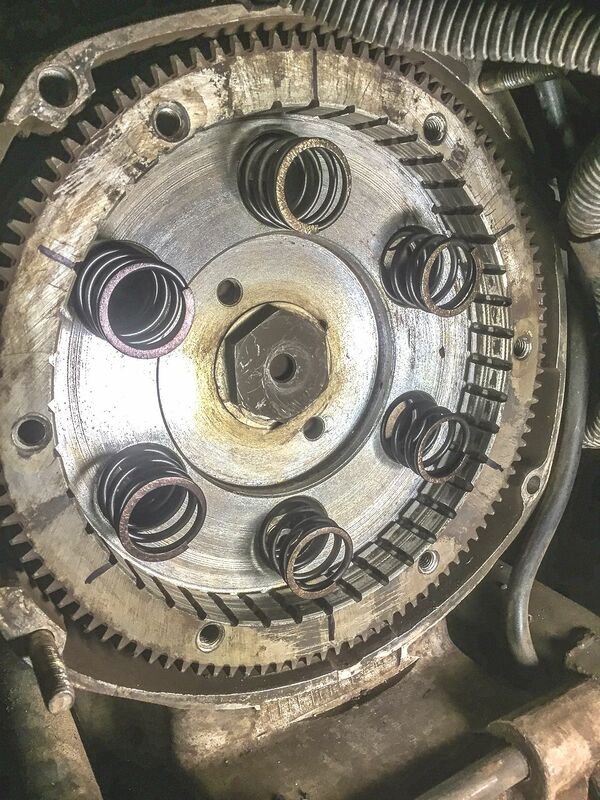 springs and rotate till they hold in place by themselves. Make sure the raised portion of the clutch driven plates face towards the rear of the motorcycle! applying pressure to hold things in place. 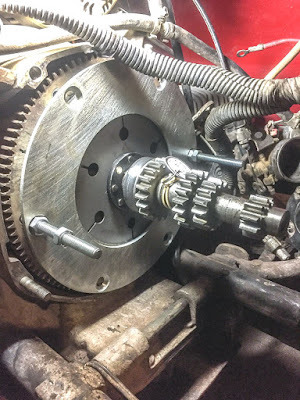 The hardest part for me this time was making sure the intermediate clutch plate lined up even with the grooves in the flywheel. You have to make sure everything is level and square by using light taps with a flat tip screwdriver so that the plate's splines engage smoothly with the flywheel grooves. Once that's ensured, it's just a matter of tightening down the two bolts in sequence till the thrust plate is almost flush with the flywheel. Then you apply the red loctite to the 4 screws for the remaining holes and put them in. 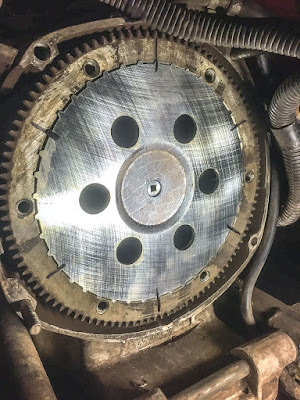 Below picture shows the splines of the two clutch driven plates are lined up nicely and I managed to also line up the venting holes to hopefully improve heat dispersal while in operation. 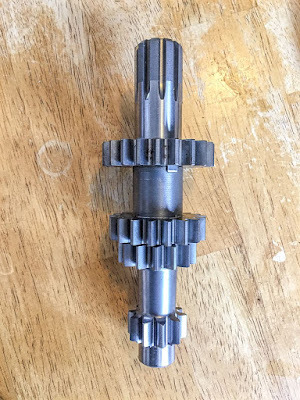 That's it, now to wait for the arrival of the replacement Input Shaft for the gearbox. Once that's done, then it's just a matter of re-assembling the tug back together and see how things go. 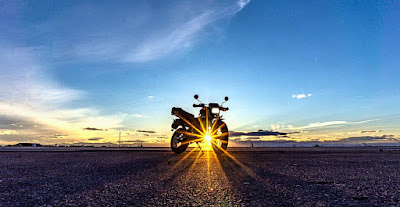 Yesterday evening, I rode Yagi the 2006 Yamaha TW200 Dual Sport over to my usual Sunset picture spot. The clouds cooperated somewhat, Yagi does silhouette nicely doesn't she? 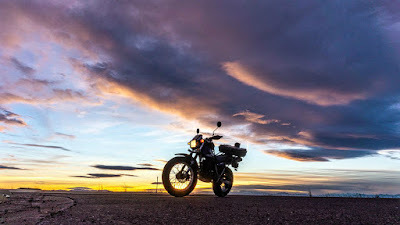 This evening, Yagi and I rode out again for the sunset but it was not to be....clouds rolled in and completely blocked the sun. Instead, I spent perhaps 30 minutes riding in the dirt trails in the vacant lot next to the sunset picturing spot. Not a large area but several trails full of ruts, bumps, rough spots left behind when jeeps and 4x4s rode through when the mud was flowing. Yagi, did great! She basically floated over all the uneven terrain. By the second time around, I was actively seeking the worse spots to see how she did. 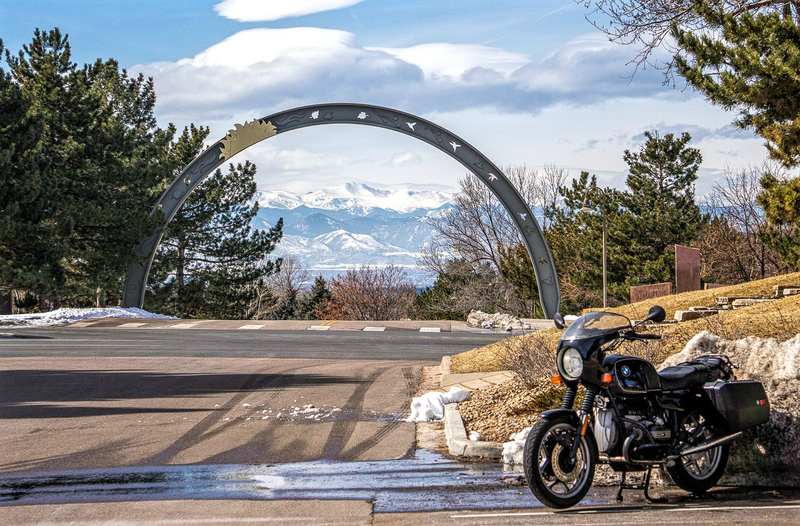 It's been a while since I rode along, delighting in the ease that Yagi negotiated terrain that my R80 Beemer would have trouble with! Or maybe, the Beemer would be fine, but the rider would have had "issues". 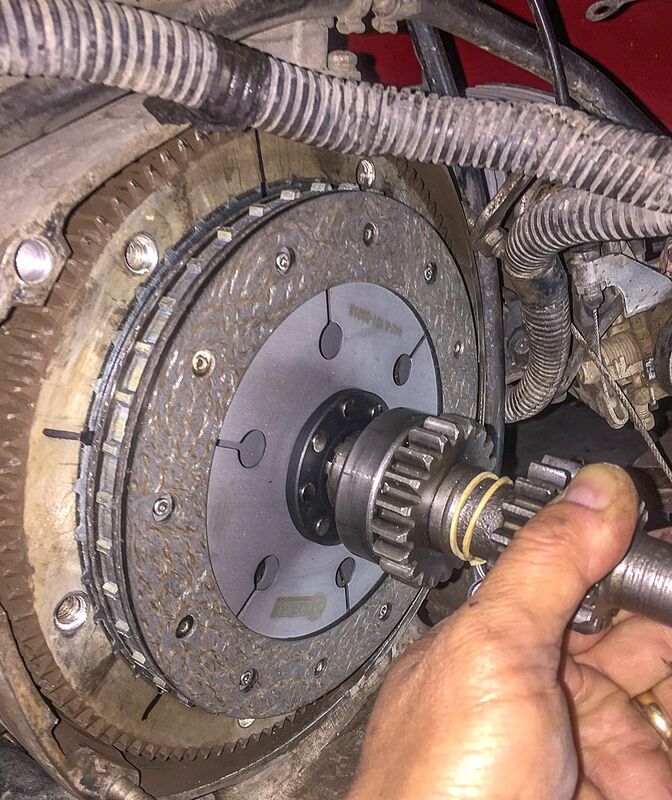 Parts have been ordered to repair the gearbox and replace the clutch components. I'll be doing the work, so wish me luck. As to Scarlett's ultimate fate, still being debated in my mind. I will tell you one thing, my Ural rigs will probably never be taken again on rough terrain....forest roads being the most difficult conditions I'll expose their clutch system.